Ralph E. Simon, a native of New Jersey, was born on October 20, 1930. He received the B.A. degree in physics from Princeton University in 1952 and Ph. D. from Cornell University in 1959. 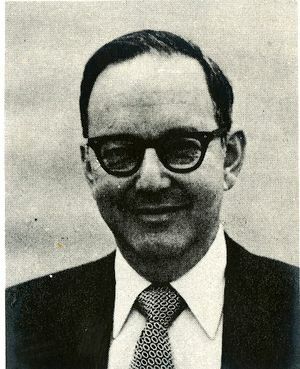 Ralph Simon was Manager of the Electro-Optics Operation of the Industrial Tube Division at RCA Electronic Components, Lancaster, Pennsylvania. From 1958 to 1968, he was engaged in fundamental studies of of electron emission from semiconductors, photoconductivity, and surface physics at RCA Laboratories, Princeton, New Jersey. In April 1968, he was appointed Director of the Conversion Devices Laboratory at RCA Labs, where he pioneered in the development of GaP, photomultipliers, silicon vidicons, and intensifiers. Dr. Simon joined RCA Components in in December 1969. A Fellow of IEEE, Dr. Simon was a member of Sigma Xi, the American Association for. Advancement of Science, and the American Physical Society. He was the holder of several patents in the area of electron emission and was the recipient of the David Sarnoff Medal for Outstanding Team Performance in Science and two RCA Achievement Awards. Dr. Simon was a diversified individual who can make a smooth transition from being the RCA executive / scientist to a pilot (he has his private license); a horticulturist working in his self-constructed greenhouse; the captain of the family sailboat for a week-end cruise; or as a better-than-average player on the tennis court. Simon was the co-recipient of the 1978 IEEE Vladimir K. Zworykin Award "For the invention and leadership in the development of the silicon target camera tube, and in the extension of electronic television into new applications." He was equally active in community affairs and served a number of years on the Lawrence Township, New Jersey, school board as a member and later as its president. He was first president of a very successful Community Action Program in Lawrence Township with noteworthy accomplishments. Ralph Simon and his wife Elena resided in Lancaster, Pennsylvania. They had three sons, Richard, David, and Michael.